A fact that is common to nearly all classic trucks is that they never carne with power-assisted steering. Back then, trucks were trucks and luxuries such as power steering were avoided to keep prices down. 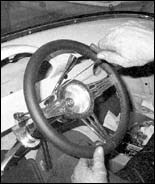 But these days, most stock manual boxes are well-worn and chasing your truck down the road with the steering wheel can get old fast. 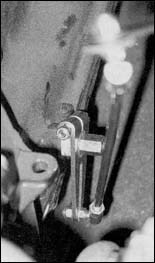 The steering problem is easily solved if you graft on an IFS setup - most kits use a rack from either a Mustang II or T-bird - but what about all you die-hards who are keeping your straight axle? Lucky for us, Cassic Performance Products has the answer with their Toyota power-steering conversion kit for '53-56 F-100s. Replacing the manual box in an Effie with a power unit from an '80-84 Toyota 4x4 is nothing new. The swap is a natural because they're roughly the same size, and the input and output shafts are in the same locations. Power-assist aside, the Toyota box outperforms the stocker with its 19:1 ratio over the Fords 24:1 ratio,and the six-turn lock to lock is reduced to just 4 and 3/4s lock to lock. The swap is now easier than ever with CPP's complete kit. 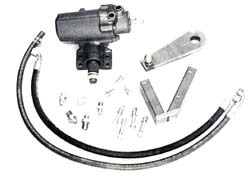 In addition to the box, you are supplied with a mounting bracket and CPP's own new hoses, as well as fittings to fit both a Ford and GM power-steering pump, a new pitman arm that attaches to the stock drag link, and all the mounting hardware. CPP also carries the U-joints necessary to adapt the box to the stock, GM, or aftermarket column, so you're covered no matter what. 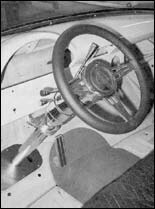 For the CPP 's 56 Effie, we installed the box along with an ididit column and billet steering wheel. We also used a new GM pump with a chrome reservoir and chrome bracketry. And, just for the record, everything we used for the story is available through CPP. Follow along as Jim and Alan get busy and check with CPP about installing a Toyota box in your own ride. that are left. Although the two boxes are quite similar, they mount differently. That's why the mounting bracket is required. 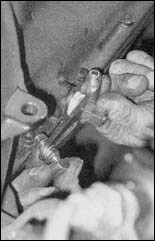 Here Alan bolts the bracket onto the box with the four supplied bolts. Now the box could be mounted onto the frame. It is important to make sure that there is plenty of clearance around the splines where they come through the frame. The mounting bolts were then torqued to 60 ft-lb. 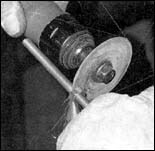 The pitman arm slides onto the output shaft and is torqued to 110 ft-lb. But first we made sure it was centered by rotating the shaft as far as it would go in both directions and splitting the difference. 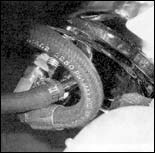 The drag link connects to the new pitman arm just as it did to the stocker. This was the last time we saw the truck for a while. When we returned to complete this story, the frame had been cleaned off and there was a new front suspension and sheetmetal. Next up was the pump install. Since the truck was fit with a small-block Chevy, we're using a GM pump and bracket from Bill's Hot Rod Company. These are all items available at CPP. 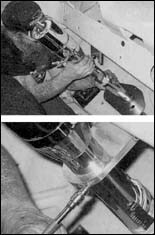 The chrome brackets were first bolted to the pump. Next, Alan buzzed on the pulley. 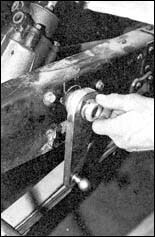 Since the pulley is so deep, you'll have to use a thin 9/16-open end wrench to tighten the adjusting nut. 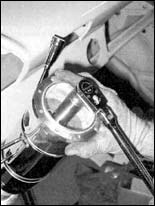 The pressure hose was also installed before the pump was mounted onto the engine. Now the pump could be hung from the engine and adjusted. 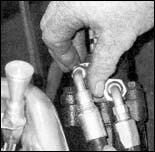 Once the return hose was routed, it was trimmed to fit on the pump. Alan then attached it with a hose clamp. CPP offers this floor fill plate, which is essential if you are changing out your column at this time. CPP is also one of the largest distributors for ididit steering columns. This one is made specifically for '53-56 Effies and features a column shift. Also shown are the column drop, billet steering wheel, adapter kit, and column dress-up kit. Alan used some masking tape to protect the column as he slid the filler panel over it. The column drop bolted right up in the existing slotted holes. Now the column was set into place, and the column drop was tightened up. Back in the cab, the dress-up kit was added in and then the adapter was bolted atop the column. The billet wheel went on next, followed by the new horn ring. 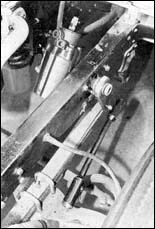 Shift linkage was supplied with the column and bolted onto the transmission. Alan marked the rod for length and trimmed it with a cutoff wheel. Now the rod was connected to the bottom of the column and tested out. There you have it-a new steering system for the Effie from your hands down to the drag link with no major surgery. We now have a straight-axle Effie that'll steer with the best of the IFS.